We will be exhibiting at Hotelympia this year and are really looking forward to it. Running between 29 February - 3 March, Hotelympia is the UK’s largest foodservice and hospitality event for any professional wanting to gain access to the latest products and thinking. Winnow in action - Visit us at Stand 2014 in the Technology Section and see Winnow in action. Have a chat with us about how we can help you cut food waste in half and empower your kitchen to run a more efficient operation. 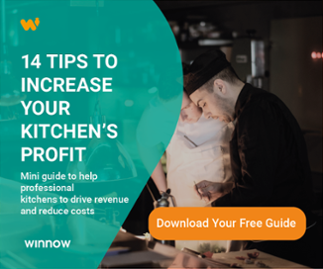 Win a seat at a lunch hosted by Hugh Fearnley-Whittingstall - The team at River Cottage Canteen Winchester has seen food waste reduced by ⅓ just over two months using Winnow. We have teamed up with them to give away five tickets to a lunch hosted by Hugh Fearnley-Whittingstall and his team. Winners will also receive a signed copy of his latest book ‘Love your Leftovers’. Enter the competition online or come and see us at stand 2014 in the Technology section at Hotelympia. Case study: Using technology to reduce food waste at Compass Group - On March 2nd at 12.30 - 1.15pm at the HOSPACE Hub Winnow’s founder Marc Zornes and Alison Taylor, Operational Excellence Lead at Compass Group will talk about how Winnow successfully reduced food waste by half over multiple sites and has the potential to revolutionise the way the hospitality sector operates. Panel Discussion: The Business Case for going green - On March 2nd at 1.45 - 2.30 on the Waste Works stage an interactive panel chaired by Siobhan O'neill, editor of Green Hotelier will discuss real world examples of where the case for sustainability makes business sense and how technology can help. Toast Ale tasting - By visiting our stand you will have the chance to taste the delicious Toast Ale, made entirely from surplus bread that would otherwise be wasted. The new beer, which was featured on Jamie and Jamie’s Friday Night Feast, gives all proceeds to food waste charity Feedback. Do not miss out, come and see us at Stand 2014, Technology Section. Not booked your place? Get your ticket here.